Hey pals! Here’s an update from our world, and a big ol reason you might not be seeing a whole lot of us this month. We’ve got big changes a foot, and Rad certainly has something to get off his chest *just wait, it’s punny*. This post is to talk about gender stuff! It might seem like a random thing to talk about on a business website, but if we do anything with the voice that we’re given-it will be to stand up for human/animal/environmental rights. We try to live a life of advocacy in many ways-some by choice: a business that centers on kindness to the planet, to animals, to people. For Christina, work in breastfeeding support and advocacy, youth mental health, special needs support and early intervention, and queers rights. Rad supports many similar causes, with a particular interest in issues affecting people of colour and marginalized populations, trans issues and rescue dogs. Other things we advocate for on a day to day basis are less of a choice. Living your truth can be very hard in a culture where your truth runs counter to everything we’ve ever been told about gender. It also makes every.single.interaction in society into a forced advocacy situation, which tends to be particularly mortifying and exhausting for an introvert and his non-confrontational partner. Even more tricky, is when you spend a lot of your time in the public eye, and have to deal with so many humans on a day to day basis. This post is to share some very personal details of our life-for your understanding and love as we heal and do our best to run this two man show as a one man band for a while (Just kidding, we have help) still…..”It’s like ten thousand spoons when all you need is a knife”. Rad is one heck of a rock star in the kitchen, and is undergoing a gender affirming top surgery tomorrow. This means to start no kitchen work for a good while. Rad is so excited to live his truth more completely, and we are humbled and thankful for your support. A little bit more about newly named “Radford” or “Rad”-fun things about his name change- we can say things like “That’s RAD!” and mean both the person or as a descriptor. Fun! Also, while Rad once used the female pronouns assigned at birth-Rad now uses ‘he or him’ instead. Neat! It’s like gender doesn’t even matter-it’s still the same person! We were so excited announce our engagement, and we’re pretty damn pumped to share this exciting new development too. Society, you leave mush-room for improvement. 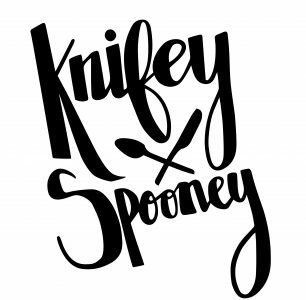 The entirety of Knifey Spooney’s existence, Radford has been jumping through the necessary hoops to get his gender affirmed both on paper and physically and he is >this close< to *finally*, *finally* getting to feel comfortable in his skin. Thank you to the insanely supportive group of people that we have wrapping us in love, thank you to our amazing staff Heather and Linda Belisle for pickup up the slack (what’s new there though) and thank *you* for your understanding in October and November as we try to recover from major surgery /parent/take on an increased workload. Also thank you to the people along the way who have put effort and compassion into properly gendering Rad and all other folks, and to the people who seek knowledge about Trans issues in order to be a better ally. To the trans community, thank you for sharing your stories, giving us support, and for showing up in a world every day that makes it hard to just exist. We love you. Thanks for loving us back!